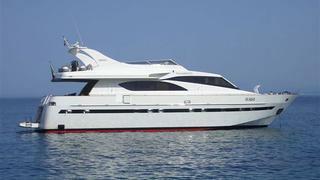 Rino Di Maggio at Self Concept in Italy gets in touch to say that he's listed the tidy 24m motor yacht Absolut for sale. Built in mahogany by the Navarcantieri yard in 2002, she's had only one owner and, says Rino, has always been very well maintained. Accommodation is for eight guests in a master suite, VIP stateroom and two twin cabins while twin 1300hp MAN engines and a planing hull give her a cruising speed of 24 knots. Absolut is asking €750,000, VAT paid.